This time of year, seasonal athletes start thinking about how to prepare for Winter. Passionate skiers and snowboarders anticipate the opening of their favorite ski areas, and they might even don their hats as instructors, patrollers, racers, or resort workers. If you haven’t been on the snow for several months, what should you do to prepare for winter as a full-time or part-time ski area employee? Here are 3 Ways skiers and snowboarders should physically prepare before hitting the slopes, in order to improve their fitness and protect their knees. You may have noticed that certain muscles tend to get tight after a season of skiing or snowboarding, especially if you work as an instructor or patroller. Hip flexors, lower back, mid back, quadriceps, hamstrings… These muscles tend to get overused, and your flexibility may decline as a result. Muscle imbalance issues typically develop over time and may lead to injury. Even if you survived last season without injury, that doesn’t mean you’re exempt from extra stretching or muscle rolling. During the off-season, be sure to focus on flexibility and restoring muscle balance throughout your body, so you’ll be re-set and ready to go for this season! A fitness program specific for skiing or boarding is important for performing responsibly on the mountain as a professional. Whatever your job at the ski area is, you need adequate strength and cardiovascular fitness to meet the demands of your job for hours at a time. For skiers and snowboarders, the most important areas to target are hip and core muscles for strengthening, as well as cardiovascular training for endurance. For your strengthening program, be sure to emphasize functional exercises, using gluteals, hamstrings, and abdominals together, because that’s how they work in your sport. Most people over-activate their quadriceps on the front of the thigh, rather than engaging their gluteals, hamstrings, and abdominals for support. For cardiovascular training, begin ramping up your exercise intensity to match how you’ll be expected to perform on the mountain. If you spend hours on skis teaching lessons, then you need to gradually increase your endurance to tolerate that demand. Going abruptly from couch potato all summer to eight-hour days on skis in November would not be a safe transition for you or anyone around you. Consider walking, jogging, circuit-training, or playing a different sport to improve your fitness capacity before you hit the slopes. The rate of injury for ski area employees is among the highest in occupational injury classifications. Over the years, the industry has taken steps to reduce injuries, including developing various safety programs, updating equipment, promoting education, and recommending “injury prevention” training programs. Injury prevention training programs are proven methods for skiers and snowboarders to protect their knees and improve performance. 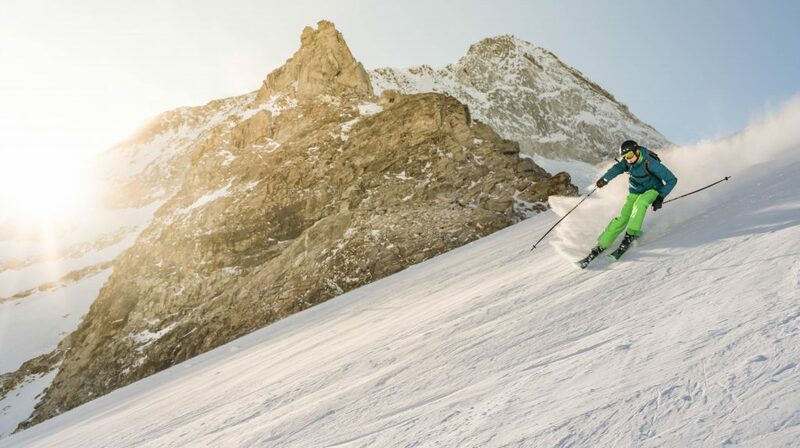 Studies involving ski instructors, ski patrollers, chair lift operators, and competitive ski racers show that a four-to-six week neuromuscular training program results in a significant reduction of injuries in ski areas, including fewer knee ligament injuries to the ACL or MCL. If you rely on your ability to ski or ride, or if you hope to enjoy another winter injury-free, the best time to participate in a program is prior to the start of your season. A good neuromuscular training program will include balance exercises, sport-specific strengthening, and functional movement re-training for body control. The exercises are simple, yet strategically instructed and progressed, so you build the necessary foundation for protecting your knees. In the past, these programs were limited to elite athletes in private facilities; however, in preparation for the 2018-19 season, industry leaders have collaborated with injury prevention experts to develop an online program that provides skiers and snowboarders easy access to a proven system to strengthen and protect their knees so a major injury is less-likely to occur. Ski area administrators and professional skiers and snowboarders are pushing safety and injury prevention programs more than ever this year. Don’t miss this opportunity to make sure your pre-season preparation is complete! In summary, skiers and snowboarders, who are employed at a ski area and expected to perform their best while on duty, are responsible for being physically fit for the job. Flexibility, strength, cardiovascular endurance, and injury prevention training should all be included as part of your winter readiness plan. For more information about the best new online injury prevention training program for skiers and snowboarders, visit the ACL Strong website and Facebook page. To Join the discussion about staying healthy, balanced, and active in your sport, join our free Facebook group, Keeping Athletes In The Game.